The application “Battery Percentage with Options” is updated! As before you can select up to 3 different battery-sizes, choice of used battery-size is done with a switch as before. Application creates a percentage-screen for main screen. When chosen alarm-threshold is achieved applications control (app-switch) is activated and now also a chosen audio-file is played either once or three times, all according users settings. Also version number is now visible in application (On bottom line). 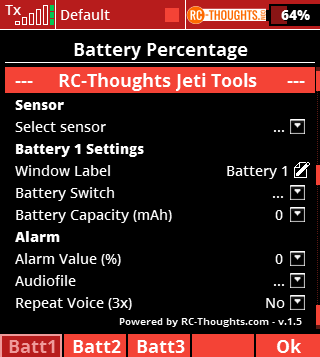 As usual, look for RC-Thoughts Jeti Tools page for more info here.